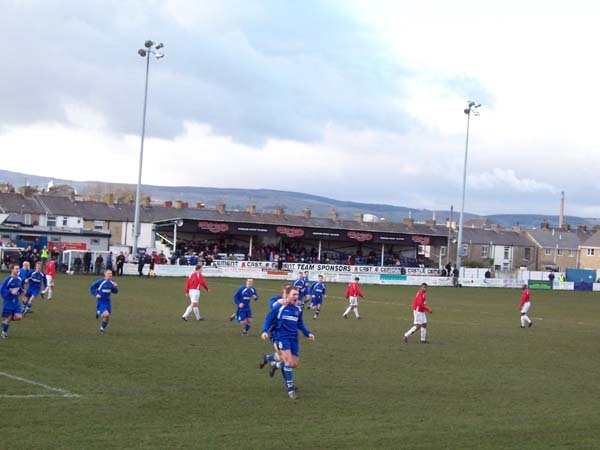 When you are used to industrial estates, wasteland and inner cities for your football action, it comes as a very pleasant change to venture out into the country and rock up to a place like Clitheroe. Situated in the Ribble Valley, the hills on either side of the ground are striking and proud. Thankfully the snow that coats them has relented to rest in this quaint basin of England and the cold snap does not claim this fixture. Clitheroe will be exceedingly happy that this fixture was able to go ahead on a Saturday as not so many will have travelled from Telford on a weeknight. Indeed the Telford supporters probably account for at least half of the today’s total attendance. Until the end of last season, Telford’s footballing representatives plied their trade in the Conference but the cost of chasing a football league dream was, for them, rather high, as they went bankrupt and effectively out of existence. À la Wimbledon, but with a more definitive ‘end’ to their original team of choice, Telford fans have chucked an AFC on as a suffix and started a new club in Northern Premier League Division One, 3 tiers below. Strictly speaking they should have started at the bottom rung of the Hellenic League, or somewhere similar but their fan base would bring dollar signs to the eyes of chairmen in whatever division they showed up. Needless to say the vocal Clitheroe fans, about 4 or 5 of them, kindly remind their visitors of their previous status and team amongst their derisory banter. A sole Telford fan retorts in the second half ‘three of you singing, there’s only three of you singing’. The pause that follows being a communal sucking in of breath, all of us around waiting for someone to say the obvious. Eventually a jolly fellow obliges with the blatant, but still funny, ‘two more than you, then’. The financial banter is the only thing that is even slightly vulgar about Clitheroe. As I say, the village is just beautiful, a very typical upmarket-ish country town, with modern coffeehouses sat next to shops stocking exclusively woollen garments, and local butcher’s crowing about their prize-winning sausages. 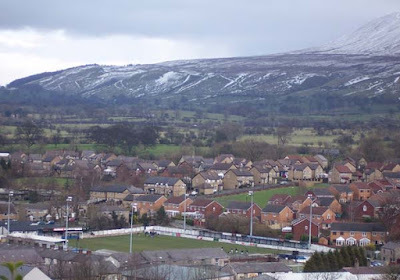 There is a kind of fort that looks down upon the town and, as the above photo shows, upon Shawbridge, the home of Clitheroe FC. Shawbridge is a classic non-league, bits and pieces ground and pretty well appointed when you consider they only popped up from the North West Counties League at the end of last season. A small stand and, the other side of the player’s tunnel, an even smaller structure that could be seating, could be terracing depending on your mood. There is also over on all 3 other sides, but mainly flat0standing or perhaps with a couple of long steps. It feels like home though, the vaguely crumbly bits befitting the antiquity of the town surrounding, with its tall chimneystacks, and a handsome church popping into view over the stands. Considering their positions at either end of the Unibond Div 1, AFC Telford should find this easy, but far from it. In the first quarter of the game while glorious chances are missed at both ends, Clitheroe’s header just past the post with time, space and a gaping goal on their side is the most disappointing. Midway through the half, Telford get themselves a penalty but keeper Kris Richens dived full length to make a quality save from Kyle Perry, while the follow up scooted just past the far post. 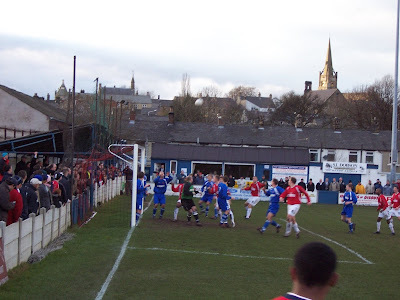 The miss and penalty let off seemed to galvanise Clitheroe who finally took a well-deserved lead as the ball was held up in front of Telford’s flailing keeper, and laid of excellently for Jason Jones to dance past one defender and thump a defiant shot into the top of the net. The manner of his dance towards the vocal throng on the terraced side showed that this clearly meant a lot. One can only assume that he thought Drysdale were planning to enter his pained whimpers into the ‘Traditional Pop Vocal’ category. 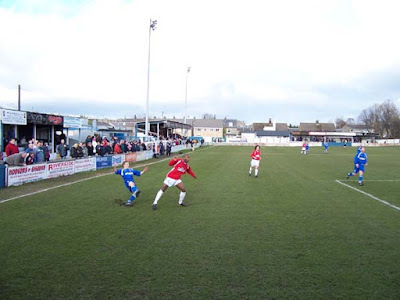 Clitheroe came out in the second half in the same manner as they had finished the first. However, this only raised the ire of Telford who fought back with gusto forcing a succession of corners. 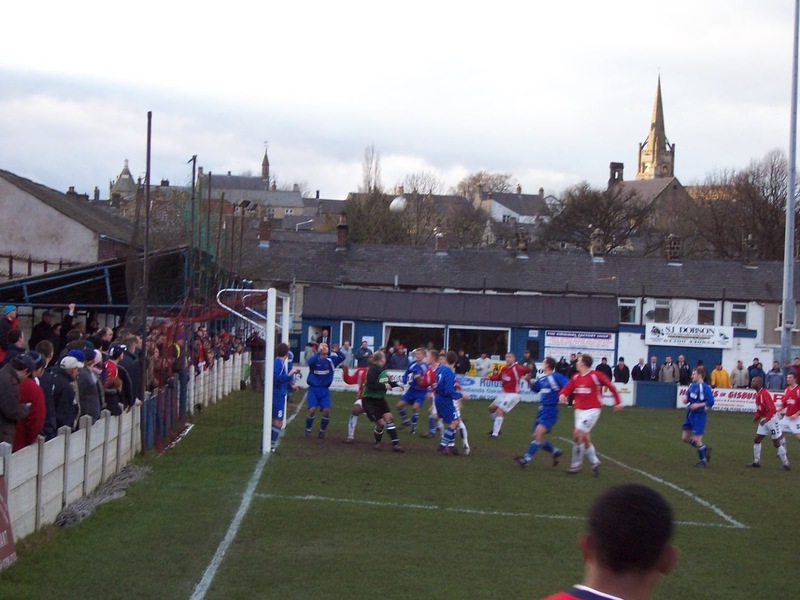 This allowed Clitheroe, however, to pick them off and break away with a shot that cannoned back off the bar. This though was the last meaningful cut of Clitheroe pressure as Telford commanded from then on, equalising in the 65th minute. A free kick curled into Richens’ body and he made his only mistake of the day in not holding onto it, which allowed meaty midfielder Jack Cudworth the chance to tuck it away. The final 15 minutes was all Telford but they were just about kept at bay, their best opportunity a skimming shot that looked bound for the bottom corner before Richens’ palmed it just wide of the post. Come the final whistle, 1-1 suitably reflected the dominant periods of either side, but Clitheroe were likely the more relieved. A decent game found in gorgeous surroundings, then. It’s what the hobo treadin’ is all about achievin’, when all is said an’ done.